I saw Avatar in RealD 3D last night as it was winning the Golden Globe for picture of the year. I agree that it's a deserving insta-classic. My complaints are minor: Trite and cliched dialog. Arguably overlong action sequences. A lack of deep acting chops. Awful music (especially the song during the end credits) that mirrors ultra-creative Director James Cameron's painful Titanic soundtrack. Other than that: Whoa! 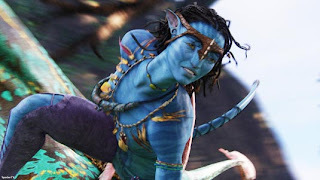 Avatar is a mind-bending sociological statement in the style of all the best science-fiction classics. It seems there are two types of people in the world: those who love sci-fi and those who hate sci-fi. That is the line that ultimately determines how much one likes this movie. Even still, anyone who likes The Wizard of Oz, Star Wars, E.T., Planet of the Apes, King Kong '76, and Lost (movies and a TV show that have allowed sci-fi haters to come to our side) should find something to enjoy about this surprisingly sensual thriller. The hero has competing forces of a mining corporation, the military, scientists who create avatars and are making some huge technological leaps, and a potential life mate (who just happens to be from a different species) weighing on him as tries to save a future world and its inhabitants from the same kinds of greedy invaders who are rampaging our own world. The environmental, war, and big business metaphors sprinkled liberally and without shame are the essence of great sci-fi stories. It will be interesting to see what the stuffy Academy Award judges will do about this movie, but there's no doubt among the rest of us that this is the movie of the year.